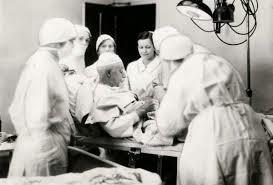 On February 15, 1921, there was a doctor who performed an appendectomy. The doctor performing the surgery was Dr. Evan Kane who over his 37-year medical career had performed nearly 4,000 appendectomies, so this surgery was not at all unusual except for two things. First of all, this was the first time that local anesthesia had ever been used in major surgery. Dr. Kane believed that local anesthesia was safer than putting a patient completely to sleep. Most of his colleagues agreed with him in principle, but they wanted to see first if it would actually work. So Dr. Kane searched for a volunteer, a patient who would be willing to undergo surgery while under local anesthesia. It wasn't easy to find one. Most people are squeamish at the thought of being awake during their own surgery. Others are fearful that the anesthesia might wear off too soon. But I said there were two facts that made this surgery unusual. I've told you the first: the use of local anesthesia. The second unusual thing was the patient -- the patient was Dr. Kane. You see, in order to prove his point, Dr. Kane operated on himself. The doctor became a patient in order to convince the patients to trust the doctor. As unbelievable as that may seem, it is insignificant compared with what Jesus Christ did for us. The Great Physician voluntarily became one of us. He placed himself in our shoes. He left the glories of heaven to live on this earth as one of us -- to suffer our pains and feel our fears. Why? So that when you hurt, you will know that you have someone who understands -- your Great Physician -- and you will have confidence to go to him for healing. Dear Lord, thank You for coming to Earth to become one of us and walked in our shoes so that as we go through things we can look to you and know You went through them also and understand. In Jesus’ Name, Amen.